Camp Royall is a hub of year-round activity that offers a caring, accepting atmosphere and celebrates each individual. The 133-acre camp near Pittsboro is the nation’s largest and oldest autism camp, serving thousands of people each year. After spending time at Camp Royall, individuals show increases in confidence, independence, and a willingness to try new things. Our programs also provide needed respite for families and peace of mind that their loved one is in a safe and loving environment. Campers receive close supervision from highly trained staff; our counselor-to-camper ratio is 1:1 or 1:2, depending on the campers’ level of need. 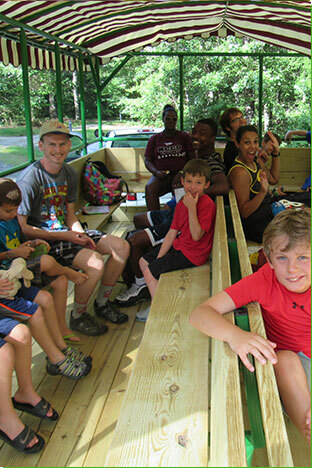 During the summer, Camp Royall offers residential and day camp. Year-round programs include Family Fun Days and Family Camping, Mini Camps, Adult Retreats, Week-Long Camps during school breaks, an Afterschool Program, and Teen Tuesday (social groups for teens).